German consumer durables retail benefits from the country ́s robust economic performance, with household consumption expected to grow 2 % in 2015 after 1.2 % registered in 2014. According to a the German Statistics Office, non-food retail turnover (excluding car sales) increased 1.9% year-on-year in 2014, after a slight 0.1% decrease in 2013. 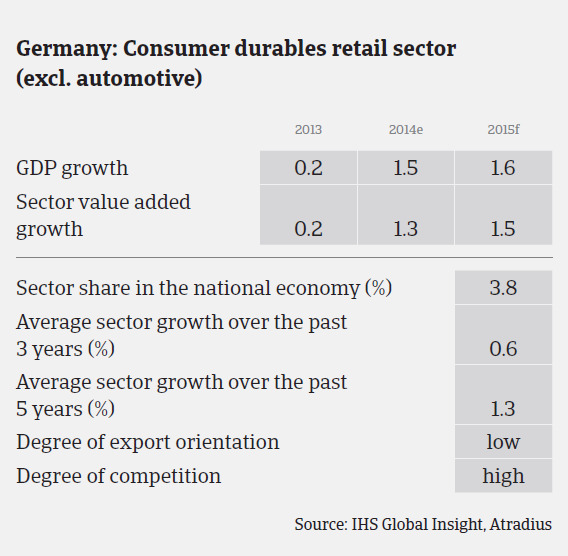 German consumer durables retail benefits from the country´s robust economic performance, with household consumption expected to grow 2% in 2015 after 1.2% registered in 2014. Between 2011 and 2013, a main issue for consumers (and subsequently for the retail sector) was higher inflation, triggered mainly by increased prices for fuel, electricity and food, which had a negative effect on spending for other goods. However, in 2014 inflation decreased to 0.9%, due to sharply decreased oil prices and a modest rise in food prices. German inflation is forecast to remain low in 2015, at 0.8%, while the (already low) unemployment rate is expected to decrease further. Both factors will most probably sustain consumer durables sales. According to the research institute GfK, in 2014 sales of large electric domestic appliances increased 5.2%, to EUR 8.5 billion and 4.6%, to EUR 3.5 billion for small electric domestic appliances. GfK expects sales growth of those items to continue in 2015, given improved consumer confidence and low inflation. According to the German association of furniture industries BVDM, in 2014 furniture turnover increased 1.8%, to EUR 31.3 billion. In 2015, another increase of around 1.5% is expected, due to the rising number of building licenses and households in Germany. The 10 largest furniture retailers hold about 48% of the market share, and this percentage is growing as the trend of consolidation progresses. Therefore, smaller and mid-sized furniture retailers are still struggling to cope with the fast growing market leaders. At the same time, they are facing additional pressure from online retailers. 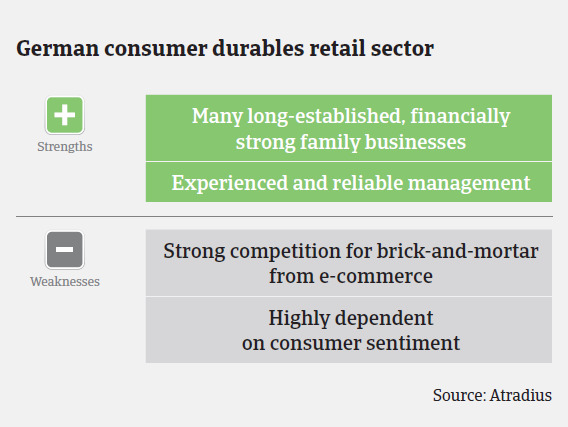 Across all subsectors, we still see consumer durables retail as a medium-risk sector. We maintain close contact with consumer durables buyers, with whom we have built good relationships over recent years. Generally, our emphasis is on inspecting financial results shortly after publishing (annual results, interim results, latest budget and liquidity plans), especially if we are to cover larger exposures. We do not cover newly established firms during their first year of business unless they are members of a well-known group or have branched out from an established company. At the same time, we closely observe the growing competition between online and brick-and-mortar retailers. The share of e-commerce as a percentage of total retail turnover has increased to nearly 9% in 2014 and is expected to continue to grow. In order to stay competitive, brick-and-mortar businesses have to add online sales channels and/or provide extra services, such as comprehensive customer sales advice and sales or return offers. However, it remains to be seen if even then customers are willing to purchase goods, given higher prices. Payment terms in the consumer durables retail segment vary between 30 days and 120 days and even longer, depending on the market power of individual retailers. In general, however, they range from 30 days to 60 days. Payment behaviour in the German consumer durables sector has so far remained both good and stable, and we expect no major changes as the general outlook for all subsectors is positive. However, when businesses cannot pass on increased costs to customers/consumers or compensate for this with savings elsewhere, they might demand extended payment terms. We monitor payment behaviour closely in all subsectors and inform our customers immediately of any deterioration. Price transparency, made available to consumers by online retailers, maintains pressure on margins along the whole value chain. 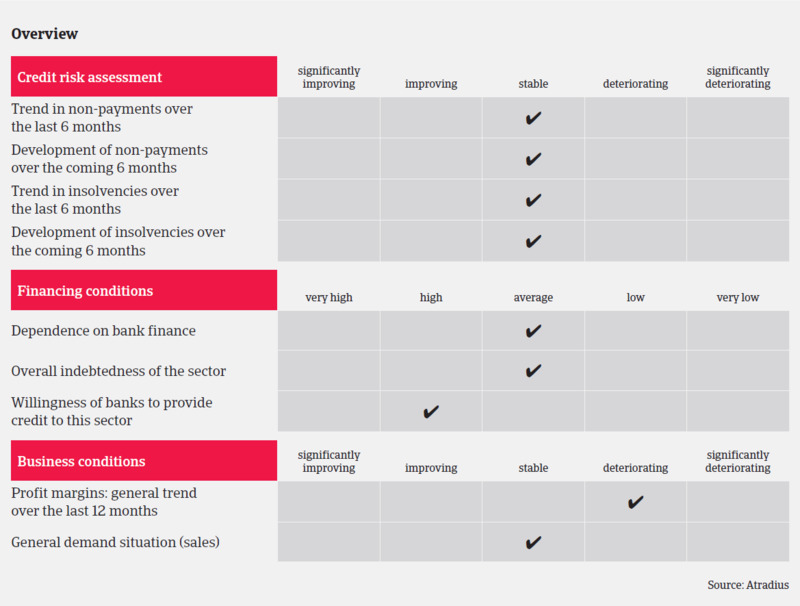 However, the sector is still quite resilient, with no negative developments for payment behaviour or insolvency expected this year.